“I need rhubarb recipes!” cried a reader and Patron. “Have you tried my awesome rhubarb coffee cake?” I suggested. Ah, yes. It’s that time of year. I love rhubarb, but there is a limit to how much coffee cake a belly can handle. 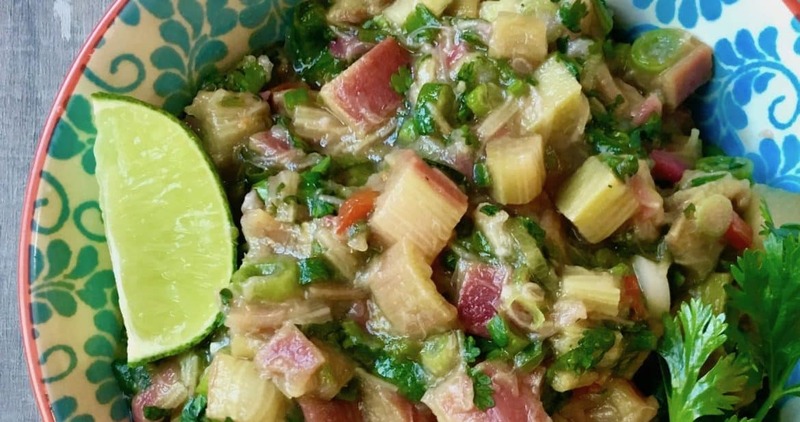 Enter this Rhubarb Salsa. 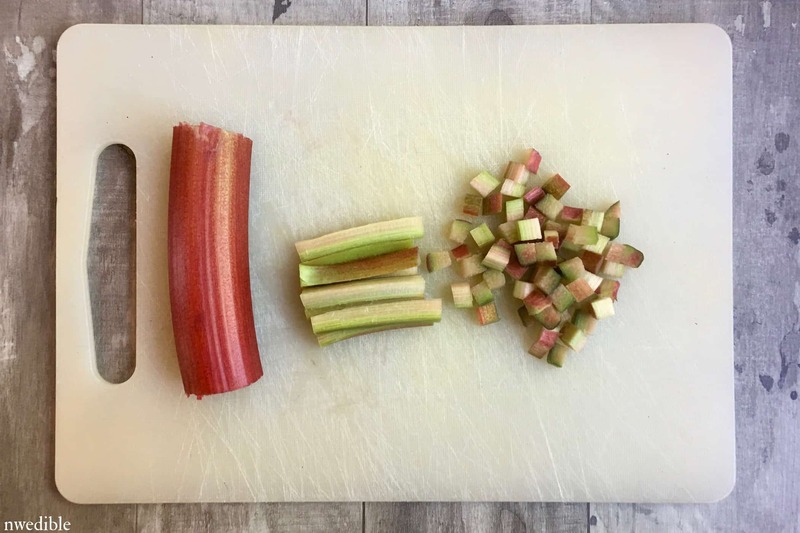 If you are only familiar with rhubarb as a rather grandmotherly addition to sweet crisps, cobblers and cakes, the idea of using rhubarb in a savory application can be a little weird. Salsa is the perfect introduction to non-dessert uses for rhubarb. The tart, floral quality of rhubarb is similar to the flavor of a mild nectarine stripped of its sugars. 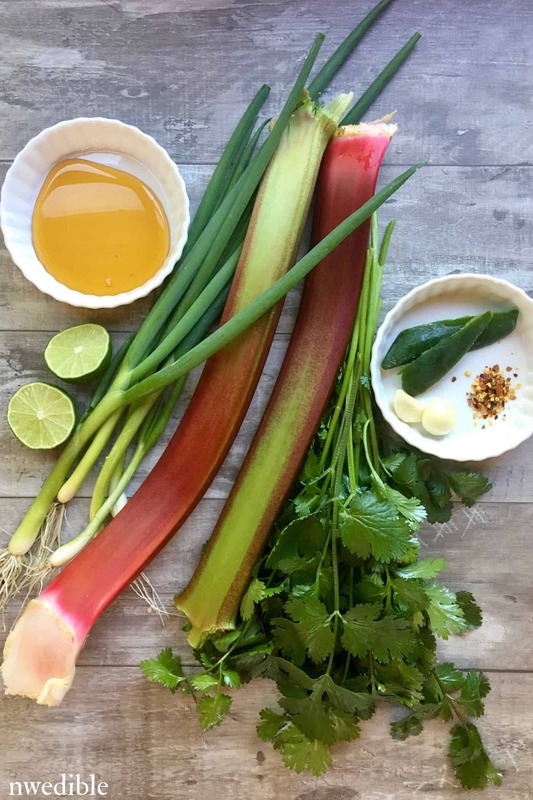 We add just enough sugar – in the form of honey – to rectify nature’s omission, then mix the rhubarb with herbs, garlic, chili and lime. The result is akin to a salsa made with white nectarines. If you like fruit salsas, I think you will like this very much. Diced rhubarb is first blanched very briefly to tenderize the stalk and bring out the mellow, floral flavors hiding under the raw tartness. If you overcook the rhubarb, the cubes will fall apart into little rhubarb strings. The flavor will still be good, but the texture won’t be as nice. Honey tempers rhubarb’s sour bite. I like 1 tablespoon of honey for each cup of diced rhubarb, but you may want to add a bit more if you prefer more sweetness. My kids thought the salsa as made was a little puckery. I thought it was perfectly sweet-tart. If you like, white or brown sugar can be substituted for the honey. After the rhubarb is blanched and tossed with honey, standard salsa stuff is added: onions, cilantro, lime, jalapeno, etc. I have lots of green onion and cilantro in my garden right now, so this recipe is skewed towards those lovely green things. You can use white or red bulb onion in place of the green onion if you prefer. Most of the ingredients in this simple salsa are probably growing in your garden. Start by harvesting them. Dice the rhubarb into small cubes. Somewhere around 3/8-inch or 1/2-inch is about right. If your rhubarb stalks are small and thin, you might only have to cut them in half before slicing into pieces. I had to cut my honking big pieces of rhubarb into eighths. 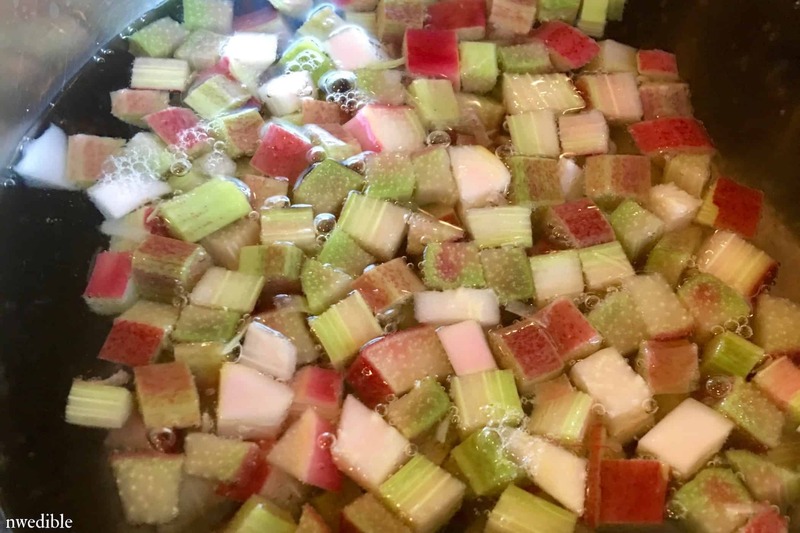 Dump all your rhubarb cubes into a pot of water at a hard boil. The goal is to get the rhubarb tender but not let it fall apart. Cook the rhubarb for about 1 minute. Depending on how large your pieces are and how large your pot is, you might need to pull the rhubarb off the heat after just 45 seconds. Larger pieces may need up to 90 seconds. If you aren’t sure, just set a timer for for 1 minute. If the water comes back up to a hard rolling boil before the time goes off, adjust your heat down just a smidgen to take some of the aggression out of the boil. Sweeten the blanched rhubarb pieces with honey, then let cool to room temperature. Add the rest of your ingredients, adjust the flavor to your taste, and dig in! 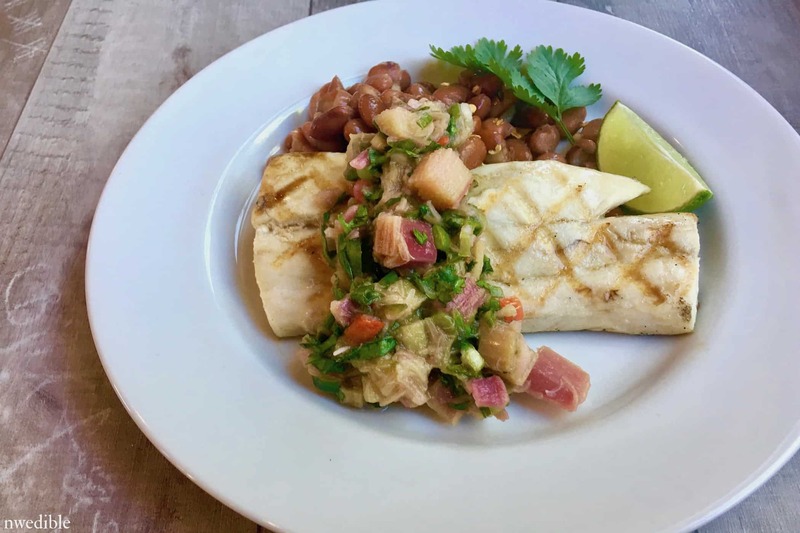 The rhubarb salsa was fantastic with grilled Mahi Mahi. It would be an excellent accompaniment to nearly any fish: salmon, cod, swordfish, halibut and sablefish would all be great paired. 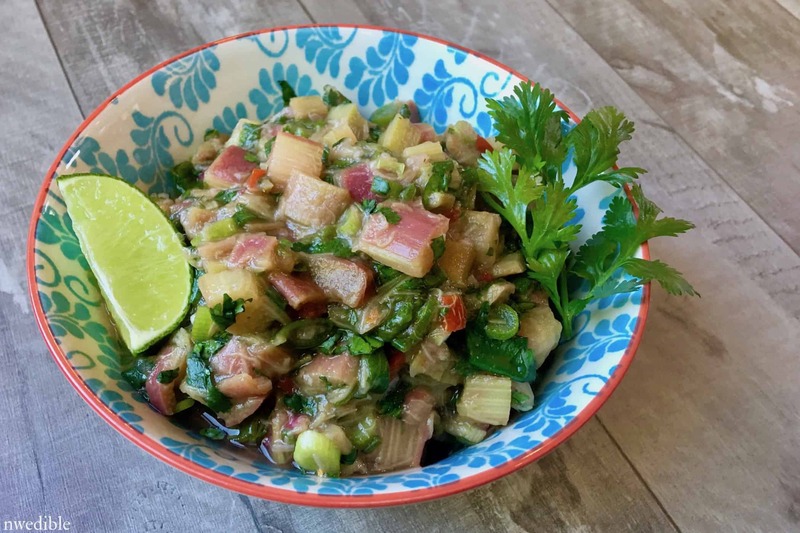 Chicken or pork, particularly simple grilled or seared cutlets, would also be a good match for this rhubarb salsa. It’s not the same as a classic tomato salsa, but this would be lovely served with tortilla chips as a snack. A sweet-tart fruity salsa that's excellent with fish or chicken. Measure the honey into a medium bowl. Set aside. Blanch the rhubarb. Bring a large pot of water to a boil over high heat, then add the diced rhubarb. Cook for 45 - 90 seconds, until rhubarb is just tender. Do not overcook. Drain rhubarb very well, then immediately transfer diced rhubarb to the bowl with the honey and stir gently to coat the rhubarb in the honey. Let the rhubarb cool to room temperature. Add the green onion, cilantro, jalapeno, garlic, lime juice and chili flakes to the rhubarb. Season to taste with salt and pepper. Adjust flavor with additional honey or lime juice as needed. If you overcook the rhubarb, it will lose its diced shape and fall apart into tiny rhubarb threads. While the flavor will still be good in the salsa, the texture will be more mushy. This recipe is not suitable for canning. Please consume fresh. I’ve recently noticed that some of my flowers track the sun while others don’t seem to. Why ? Sounds delicious. On the sweet side rhubarb and black raspberries together are amazing. It is my favorite pie filling, the seeds from the black raspberries aren’t as intense with the rhubarb mixed in. Any idea whether this can be canned? “Hooray!” she cried, while perusing the internets while her rhubarb crisp, the 799th of the season, baked in the oven. 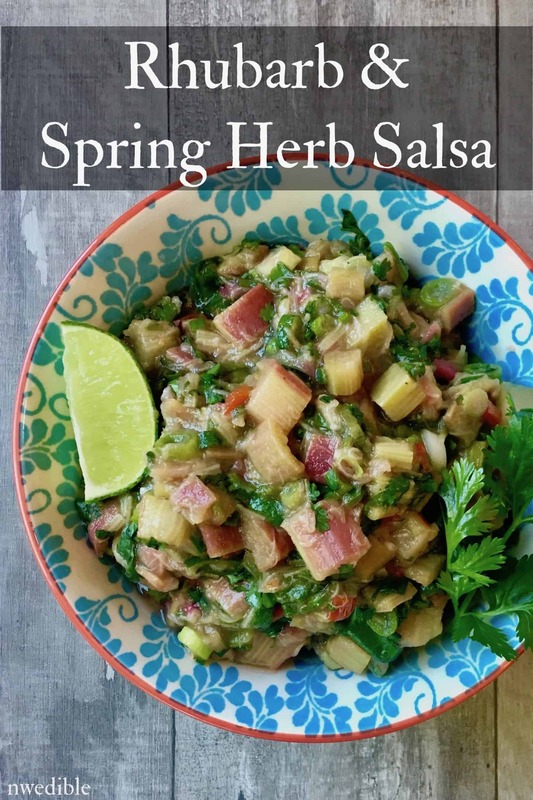 We made the Rhubarb and Spring Herb Salsa for Taco Tuesday and it was very good! Thanks so much for the inspiration! I used some cherry concentrate and maple syrup to sweeten the rhubarb and keep it vegan. While the flavors were nice, the color wasn’t great. I’d hoped the cherry concentrate would add a lovely red color, but it mostly just muddied things. So, not nearly as lovely as your pic, but still quite tasty. It looks very delicious. Thanks for sharing this amazing step by step recipe. Taco Tuesday and it was very good! Thanks so much for the inspiration! I used some cherry concentrate and maple syrup to sweeten the rhubarb and keep it vegan. While the flavors were nice, the color wasn’t great. I’d hoped the cherry concentrate would add a lovely red color, but it mostly just muddied things. So, not nearly as lovely as your pic, but still quite tasty.